Each month Pastor Roman Kozak provides Sunday Line & World Ministries supporters with a short devotional. Pastors Roman and Pat Kozak lead the congregatin of Church in the Park in White Rock, BC. The church holds Sunday Services at 10 am at White Rock Community Centre, 15154 Russell Avenue, White Rock, BC. Church in the Park is affiliated with Sunday Line Communications Society. 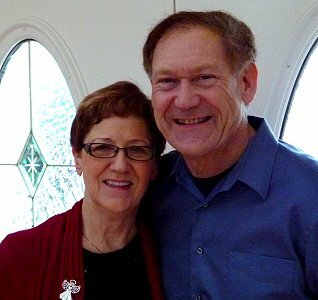 Pastors Roman and Pat serve as Vice President/Treasurer and Director on the Sunday Line & World Ministries Board. One of the theological terms we often hear used in describing the sacrifice of Jesus is the word "vicarious". Although most people, including many Christians, have some concept about the death of Jesus, many still do not have a real understanding as to what the term vicarious really means when it comes to Jesus sacrifice . . .
May the Name of the Lord be praised! One book in the Old Testament concerning whose background we know almost nothing for certain is the book of Job. We do not know the author, although some think that it might have been Moses. We do not know the precise time frame in which the account takes place, although some believe that it could have been during the patriarchal age. We do not even know exactly where Uz was. However, the book of Job is part of the inspired Scriptures and therefore contains a message from God. And, so, this month, we want to look at Job 1:1-22 and see what we can learn from Job. Mary Magdalene is the woman from whom Jesus had cast out seven demons, and was one of the first to come to the tomb very early Sunday morning while it was "still dark" to discover that the Lord's body was gone. She immediately ran to tell Peter and John. Both Peter and John ran together to the tomb. John outran Peter and hesitated about going in while Peter, who came up behind him, ran straight in. The body of Jesus was definitely gone. Where were the guards? Who had moved the stone? What was going on? "Behold the Lamb who takes away the sin of the world"
One of the theological terms we often hear used in describing the sacrifice of Jesus is the word "vicarious". Although most people, including many Christians, have some concept about the death of Jesus, many still do not have a real understanding as to what the term vicarious really means when it comes to Jesus' sacrifice. ". . . But we preach Christ crucified: a stumbling block to the Jews and foolishness to the Gentiles." ". . . the people I formed for myself that they may proclaim my praise." What exactly is Praise? Praise means "to commend, to applaud or magnify." Our English word "halleluiah" comes from the Hebrew word HALLEL meaning praise, the middle is U meaning you, and the word ends with YAH which is a derivative from the divine name of Yahweh, and therefore the word halleluiah means "praise the Lord." "The parable of the wise and foolish maidens"
Have you ever felt that your life is nothing but a constant waiting game? Everywhere you go today, you have to wait. I just love the new automated phone systems? After you spend 10 minutes punching all kinds of buttons it's frustrating to hear a voice say: "Sorry there is no one available to take your call at this time. Please try again later!" The Greatest Mystery of All! "Then I said, 'HERE I AM -it is written about me!'" The first question many ask is WHAT is Christianity? Christianity, unlike all religions, is relational and incarnational and means nothing less than God living with us and in us. God comes to indwell man's heart to create a new man, giving him a new nature, and a new personality. The new man is not a reformed old man, but is someone who is entirely transformed by God when a person places their faith in the "Finished Work of Jesus Christ and the Cross" . . .
"Joy to the world, the Lord has come"
Did you know that praise is one of the greatest joys of Heaven? You cannot read the book of Revelation without catching a glimpse of hosts of angels and saints worshiping and praising God. Throughout the history of Israel we constantly see that praise was a product of knowing and enjoying God's presence. In 1st Chronicles 23:3-5 and :30 David placed great emphasis on congregational worship. Out of a host of 38,000 Levites, 4,000 were ordained exclusively to worship the Lord every morning and evening . . .
"To see God is the highest aspiration of man." Malcolm Muggeridge in his book entitled "Jesus Rediscovered" made the statement written above. After almost 60 years of ministry, Bernice Gerard and Velma Chapman finished their work on earth. On May 27, 2007 Velma went on ahead of Bernice and on November 1st at ten minutes before ten in the morning, Bernice went on to join Velma in the presence of Jesus. This was very typical of their ministry. Velma was always the visionary, the spark setter . . . but it was always Bernice who got the limelight. Bernice used to say, "Velma makes the bricks and I throw them." "Then the King will say to those on His right, 'Come, you who are blessed by my Father; take your inheritance, the kingdom prepared for you since the creation of the world.'" Have you ever tried to impress someone by trying to be something that you are not? Perhaps it was a friend, an employer, a work mate or someone else . . . if we are honest with ourselves, we can all say that we have all at one time or another tried to impress someone by trying to be somebody else. Don't feel bad because it's just part of our fallen human nature . . .
"There is no one righteous, not even one." God in His holiness must judge the sin. I Will Be With You! Jesus' final words to His disciples in John 20:21 give His disciples this powerful charge. Have you ever stopped to reflect on what Jesus is really saying? It is easy to underestimate the full meaning of Jesus' words. Jesus is not simply sending the Church to get some provisions at the corner store. The early Church was to challenge the might of the heathen empires; they were to undermine authorities and repudiate their doctrines and beliefs. They were to denounce and condemn everything anti-Christ which would bring down the wrath of emperors. Some would be fed to hungry lions and burned at the stake. Many would be stoned, whipped and crucified and the world would hate them . . .
"I will pour out my Spirit on all people. Your sons and daughters will prophesy, your old men will dream dreams, your young men will see visions." Joel was a prophet in the southern kingdom of Judah who lived approximately 900 years before the Day of Pentecost and is classed as one of the "Minor Prophets", not meaning that he was under age, but rather, that Minor Prophets also gave strong messages but they were shorter in length than the Major Prophets . . .
"This valley will be filled with water . . . This is an easy thing in the eyes of the Lord." In Jeremiah's day the prophet spoke a message to a people who were destined to be carried off to captivity. Jeremiah's message in Jeremiah 1:10 spoke of "a time to pluck up and to break down, to destroy and to overthrow." He spoke to a people who did not have the Holy Spirit and a nation which God Himself had destined to be brought into captivity. Today the Holy Spirit is NOT calling the church to pluck up and break down but He is calling the church OUT of captivity. As in the days of Nehemiah, Ezra, Haggai and Zechariah, the Holy Spirit is calling the church from a time of exile to a time of rebuilding . . .
"Then he said, 'Look, I have come to do your will.' He cancels the first covenant in order to put the second into effect." On the Day of Atonement you will recall that the goat of the sin offering did not die under the hand of just any common man, but died under the hand of one specific person holding a specific office. That specific office was called the High Priest. It was the specific office and duty of the High Priest to act as the executioner of the sacrifice, and not any common man or men. And furthermore, by virtue of his office, was allowed only once a year to take the blood of the sacrifice into the most holy place of the tabernacle into the presence of God and sprinkle the blood on the mercy seat for the sins of the nation . . .
We Have a Living Hope! "Praise be to the God and Father of our Lord Jesus Christ! In his great mercy he has given us new birth into a living hope through the resurrection of Jesus Christ from the dead, and into an inheritance that can never perish, spoil or fade. This inheritance is kept in heaven for you"
When God told Noah to build an ark because He was going to send down the rain, it had never rained before and the people mocked Noah but Noah trusted God and he and his whole household were saved from the flood. When God called Abraham and promised to bless him with a child in his old age he trusted God, even though Sarah was good as dead, and God brought forth his son Isaac. When God asked Abraham to sacrifice his son Isaac, Abraham trusted God that He would bring him back from the dead and God blessed Abraham for his obedience and provided a substitute. In Genesis 39 we read that when Potiphar's wife begged Joseph to come to bed with her, he trusted God and told her he could not do such a wicked thing and sin against God. When she tried to force him he fled and went to prison rather than yield to temptation, and in time God elevated Joseph to the highest position in Egypt next to Pharaoh . . .
"I have come to do your will O God!" When Jesus became man, he came to do the will of His Father in Heaven. How many Christians would be able to say "my purpose is to do the will of God"? Man only lives on this earth for a very short time, so there is a natural desire to enjoy life by focusing on immediate needs and gratification. But is this really what God wants from Christians? The answer of course is NO! When God created man He designed Him to have a free will. And the reason in giving mankind the freedom of his will is so that man would choose God's will over our self-will. God has given us the intelligence to understand that there is a better way than living a self-willed life. The problem is that self must get off the throne and let God's will be what motivates our lives. It is truly a matter of obedience and trust . . .
"Now give me this hill country!!!" In today's passage we see that after the people of Israel had crossed the Jordan and conquered much of the land, Caleb came to Joshua with a request. Caleb reminded Joshua that he was only 40 years old when Moses sent him and Joshua, together with 10 other men, to spy out the land of Promise. But, as we recall from the story recorded in Numbers 13, only Caleb and Joshua came back with a good report. The other ten spies came back with a bad report . . .